The radar instruments on some satellites can be used to gather all sorts of interesting information. The animation above (see video) illustrates wave heights in the North Sea that were derived from satellite radar measurements. Wave height and frequency in a large body of water are largely dependent on the speed of the wind moving across the surface. Satellites with specialized radar sensors can measure wind speed by looking at the ocean surface from several angles as it passes over. The radar detects the reflectivity of the water, which is determined by the roughness of the surface. Higher reflectivity means rougher water, which is caused by stronger winds. Wind direction can be estimated by looking at wind streaks in radar images of the water’s surface. Thousands of shipping containers are lost from cargo vessels each year. Many of these containers eventually sink to the deep seafloor. In 2004, researchers at the Monterey Bay Aquarium Research Institute (MBARI) discovered a lost shipping container almost 1,300 meters (4,200 feet) below the surface of the Monterey Bay National Marine Sanctuary. In the first ever survey of its kind, researchers from MBARI and the Sanctuary recently described how deep-sea animal communities on and around the container differed from those in surrounding areas. The red dots seen in some of the underwater footage are lasers mounted on the remotely operated submersible. The lasers are 29 cm apart and allow the scientists to estimate animal size. In 2004, scientists at the Monterey Bay Aquarium Research Institute (MBARI) discovered a lost shipping container almost 1,300 meters (4,200 feet) below the surface of the Monterey Bay National Marine Sanctuary. In the first-ever survey of its kind, researchers from MBARI and the sanctuary recently described how deep-sea animal communities on and around the container differed from those in surrounding areas. In February 2004, the cargo vessel Med Taipei was traveling southward along the California coast when severe winds and seas dislodged 24 shipping containers, 15 of which were lost within the boundaries of the Monterey Bay National Marine Sanctuary. Four months later, during a routine research dive using the remotely operated vehicle (ROV) Ventana, MBARI scientists discovered one of these containers on the seafloor. In March 2011, a research team led by Andrew DeVogelaere of the sanctuary and Jim Barry of MBARI completed another ROV dive at the container. During this dive, they collected extensive video footage, as well as samples of seafloor sediment at various distances from the container. They then compared the animals found on the container, on the nearby seafloor, and on the surrounding seafloor out to 500 meters (a third of a mile) away from the container. In early May, 2014 they published their findings in the journal Marine Pollution Bulletin. Josi Taylor, the lead author of the recent article, said that she was surprised to see how little the container had corroded in the seven years since it sank to the seafloor. Apparently, the near-freezing water and low oxygen concentrations in the deep sea slowed the processes that might degrade sunken containers in shallower water. As expected, the hard surface of the container acted somewhat like a rocky reef, attracting animals such as tubeworms, scallops, snails, and tunicates. Such animals require hard surfaces on which to attach, and were not found on the muddy seafloor around the container. Surprisingly, several types of animals found on nearby rocky reefs, such as sponges, soft corals, and crinoids (a distant relative of sea stars), had not colonized the surface of the container. In their paper, the researchers speculate that some of these slow-growing animals might not have had enough time to colonize the container’s surface. Another possible explanation is that some types of animals may be sensitive to the potentially toxic effects of corrosion-resistant coatings used on shipping containers. The team conducted a follow-up ROV dive in December 2013 to study possible effects of the container’s coating. The samples from this dive are still being analyzed. The researchers also discovered differences in the types of animals living on the muddy seafloor within about 10 meters (32 feet) of the container. Within this zone, deep-sea snails in the genus Neptunea and some types of crabs and fish, including deep-sea rockfish, were more abundant than in surrounding areas, while sea pens and other filter feeders were less abundant. a possible source of toxic materials. The researchers also believe the container is having indirect ecological impacts, some of which may take years or decades to develop. For example, higher numbers of seafloor predators near the container might explain some of the changes in the types of other animals found on the nearby seafloor. Such indirect ecological effects might also explain why the diversity of seafloor animals was lower near the container. This collaborative research project has already helped government agencies in formulating standards for how containers are weighed, stacked, and lashed down. It has also spurred interest from both governmental agencies and the shipping industry in finding a way to track the number of containers lost at sea each year. During future dives to the container, the researchers hope to find out whether more diverse animal communities will develop over time, or if some toxic material is allowing only certain hardy animals to colonize the container. They are also designing a study to compare the effects of different types of container coatings on colonization by deep-sea animals. This particular container held a shipment of car tires. Other containers are used to transport more acutely toxic materials, such as batteries, pesticides, and raw chemicals. These substances would only add to the possible effects of a sunken container. Given the slow rate at which the sunken container is corroding, and evidence from deep-sea shipwrecks such as the Titanic, the researchers hypothesize that lost containers may take hundreds of years to fully degrade in the deep sea. This suggests that each year thousands of shipping containers are accumulating on the deep seafloor, especially along busy shipping routes. 17363 ed30 Pybus Bay. Frederick Sound;Hobart and Windham Bays. Stephens P.
In the September 1966 issue of Popular Science, author John Steinbeck made the case for giving deep-sea exploration the same attention as the space race. Three years before the first humans landed on the moon, Nobel-prize winning author John Steinbeck published a passionate plea in Popular Science for equal efforts to explore "inner space." In an open letter to editor-in-chief Ernest Heyn, Steinbeck argued that the investigation of Earth's oceans was critical to the success of humanity and deserved the same funding and organization as space exploration. You can read this letter as it originally appeared in the September 1966 issue of Popular Science. Dear Ernie Heyn: I know enough about the sea to know how pitifully little we know about it. We have not, as a nation and a world, been alert to the absolute necessity of going back to the sea for our survival. I do not think $21 billion, or a hundred of the same, is too high a price for a round-trip ticket to the moon. But it does seem unrealistic, unreasonable, romantic, and very human that we indulge in these passionate pyrotechnics when, under the seas, three-fifths of our own world and over three-fifths of our world's treasure is unknown, undiscovered, and unclaimed. Please believe, Ernie, that my passion for the world's seas and underseas does not lessen my interest in our space probes. When the astronauts go up in their beautiful skyrockets, my stomach goes up with them until it collides with my lungs and pushes them against my throat. I set my clock for two a.m. recently to watch a crazy scarecrow-like structure settle gently on the moon, a job of such intricacy as to stagger the imagination. But besides the sweetness and delicacy of the thinking, planning, and building, the very fact that we do it proves that human beings have not changed—we are still incurable, incorrigible romantics. We may think back with wonder on people capable of a search for the Golden Fleece, capable of picking up their lives and going on crusade in the Middle Ages—but are we any different? The budget for getting two Americans on the moon is $21 billion, and it will necessarily come to much more. And what they will bring back will be what Dr. Urey calls a pocketful of rocks for him to analyze. If you ask an American why we want to get to the moon, he will usually say, "To get there before the Russians," and the Russians probably use the same answer—to get there before we do. Pressed further, the one polled will go off into a burble of pseudoscientific jargon and equally pseudomilitary nonsense. Dr. Urey gives a truer reason—because we are curious. And it seems to me that one of the definitive diagnostics of the human animal, besides being the key to his success in survival and triumph over the forces of nature, is curiosity. But, while the lifeless rubbled surface of the inconstant moon becomes increasingly littered with the burnt-out bones of vehicles, the bathyscaphe has visited the deep and unknown places of the earth only a few times. There is never much argument about appropriations for space shots, but a recent request for money to explore, map, and evaluate the hidden places of our mother earth brought howls of protest from Congressional leaders and the inevitable question—is it really necessary? Ernie, I'm going to try to put down some of the reasons why I think it is really necessary to explore the sea. It is a pitiful few thousand years that have passed since men and women roamed the earth eating anything that didn't eat them first. Men moved as the game moved, and the game followed the grass. With the domestication of animals, the roving continued, but only following the grass. With the beginning of agriculture, the crops stood still and most men settled down. But over the years, by selection, the animals changed and the cereals changed. The grains we use today have little resemblance to their ancestor seeds, and the animals could not be recognized by their early progenitors. Man has changed the face of the earth and the inhabitants thereof, with the possible exception of himself. But the seas he has not changed. In our relation to three-fifths of the world, we correspond exactly to Neolithic man—fearful, ignorant, and swinish. We peck like sandpipers along the edges for the small treasures the restless waves wash up. We raid the procession of the migrating fishes, killing all we can. Even the killer whale herds the sperm whales and kills them only when it needs food— but we have wiped out some species entirely. We have not improved nor changed a single species of sea-going fish. And the huge agriculture of the seas we have ignored completely, except to rip out the fringes for iodine or fertilizer. I said that three-fifths of the earth's surface is under the seas—but, with the washing down from the continents of minerals and chemicals, it is probable that four-fifths of the world's wealth is there. More important in the near future, the plankton, the basic reservoir of the world's food, live in the sea. We have not even learned to make this boundless bank of protein food available for our bellies. Of all the mysteries and enigmas of our world, man is the strangest and most incomprehensible. Without the pressure of cold, hunger, disease, danger from outside, and even greater danger from the quarrelsome combativeness in his own heart, it is probable that he would still be living in trees, and still eating everything he could kill or break up into bite-sized chunks. Survival has been the mother of our inventiveness. War has spawned not only weaponry, but a knowledge of mechanics in all directions. General Hap Arnold once remarked that without war we would probably never have developed the airplane, and between wars development just about ceased. We have wiped out the animal predators that once decimated embattled families. We are by way of defeating the micro-enemies which secretly invaded our bodies to strike from within. And finally we find ourselves faced with the most ghastly enemy of all—ourselves, too many of us in a world with a limited food supply. And hungry men will destroy anything, even themselves, to get food. At the same time we have invented the cold war, a continuing state of hostility between wars, which keeps our inventiveness in the mechanics of destructiveness alive. This, too, may be the result of our uneasiness in the face of our exploding numbers. Meanwhile, the intricate and expensive skyrockets litter space with an orbiting junk pile, and we can easily justify it as a means of defense. But it is possible that we may be driven back to our mother, the sea, because we are running out of supplies. Two men with their pockets full of moon rocks will not solve the situation. On the other hand, the planning, computing minds which so gently laid that crazy-looking scarecrow on the moon could easily design the means, not only for exploring our watery world, but for placing whole producing cities on the sea bottom. If our inventive minds were given the money and the incentive of necessity for the desalting and moving of sea water, it would be a very short time before life-giving water would flow to desert places which make up so much of our world, so that they might flower and produce. To me, personally, the oceans mean safety, mystery, and wonder. During the depression I lived by the sea and took most of my protein food from it and lived very well indeed. I have studied the endless variety of ocean animal life—hundreds of thousands more species than are to be found on land. Several years ago I went along as an observer on the Mohole Project. You remember that was the expedition which put down a drill string to the earth's crust under 18,000 feet of water near Guadalupe Island, off the west coast of Mexico. We didn't get very far—took six cores through sediment and into the basic basalt of the earth's crust. But on the basis of those six cores, textbooks had to be rewritten. What we found was older than we expected and different from what we thought was there. But an attempt to probe farther has met strong resistance from some money-allotting members of Congress. The men in the rockets are rather like human sacrifices, taking a part of all of us with them. Oceanology, on the other hand, is slow, undramatic, and singularly unrewarded, although the gifts it can bring to us are measureless and will soon be desperately needed. Many wonderful men are working, studying, evaluating. At this writing there is a convention in Moscow attended by most of the world's profound students and authorities in oceanography, oceanology, seismology, zoology. They have gathered to discuss and to describe what they have learned, and what they hope to learn. Experiments are going on all over the world. Cousteau has men living undersea, and so has the American Navy. Men are learning the techniques of changing pressures. Whereas the astronauts must become accustomed to weightlessness and vacuum, the undersea men must learn to endure the opposites. They receive little official encouragement. What the exploration of the wet world lacks, and must have to proceed, is organization. Undersea study is split up into a thousand unrelated groups, subjects, plans, duplications, having neither direction nor directors. There is no one to establish the path to be followed and see that it is taken. Our space probes could not have gotten off the ground without NASA, a management for analysis, planning, engineering, and coordinating, having the power to give orders and the money to carry them out. The movement to possess the sea must be given the strength and structure to move. We must explore our world and then we must farm it and harvest its plant life. We must study, control, herd, and improve the breeds of animals, because we are shortly going to need them. And we must mine the minerals, refine the chemicals to our use. Surely the rewards are beyond anything we can now conceive, and will be increasingly needed in an over-populated and depleting world. Why, Ernie, even the lawyers will have a field day. No one owns the underseas. Think of the happy thunder of argument over property rights. For myself, I am hungry for the experience. When the next Mohole expedition goes out, I am going with it. I want to go down in the bathyscaphe to the great black depths. Surely all this should have at least equal backing with space. The Jellyfish Database Initiative, or JeDI, pictured, plots the location of jellyfish globally. It is the first of its kind to track how the marine creatures are distributed. 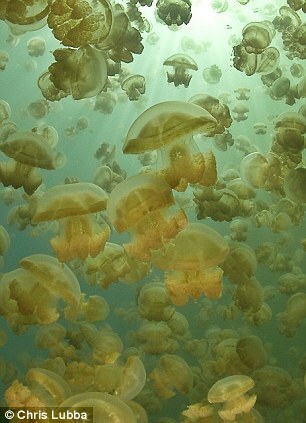 Jellyfish blooms around the world are on the rise. Recent warm weather and global warming have both been linked with an increase in sightings as well reports of giant jellyfish reaching the shores in the UK. To accurately plot this upsurge, a team of international researchers has created the Jellyfish Database Initiative, or JeDI, to track locations and predict the future spread. The greatest concentrations were spotted in the mid-latitudes of the Northern Hemisphere. As well as tracking where the largest concentrations of jellyfish currently are, scientists can use the database to learn more about their ecosystems. The international study was led by the University of Southampton. Currently, tracking the ecological and societal impacts of jellyfish and jellyfish blooms is hampered due to a lack of information. The JeDI map attempts to address this knowledge gap and covers the upper 650ft (200 metres) of the world’s oceans. This can be used to explore what causes the patterns of distribution, and why jellyfish are concentrated in certain locations around the world. 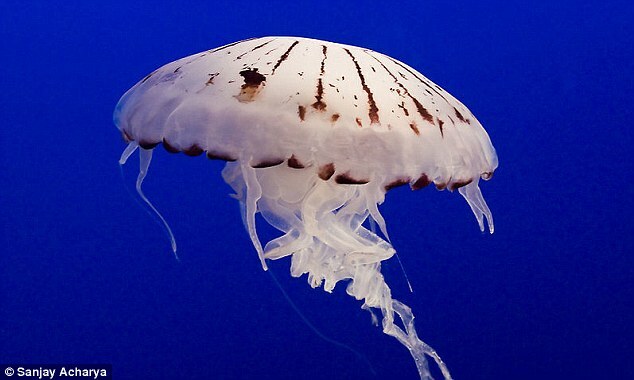 For example, using data from JeDI, authors of the study were able to show that jellyfish and other gelatinous zooplankton are present throughout the world's oceans. But the greatest concentrations are in the mid-latitudes of the Northern Hemisphere. As well as tracking where the largest concentrations of jellyfish currently are, scientists can use the database to learn more about their ecosystems and plot the future spread and distribution. In the North Atlantic Ocean, in particular, dissolved oxygen and rising sea surface temperatures were found to be the main cause of the large spread of jellyfish in this area. ‘With this resource, anyone can use JeDI to address questions about the spatial and temporal extent of jellyfish populations at local, regional and global scales, and the potential implications for ecosystem services and biogeochemical processes,’ said Dr Rob Condon of the University of North Carolina Wilmington. The analysis will be the first step to establishing a database that plots gelatinous presence in the Earth’s oceans. From which, future trends can be assessed and hypotheses tested. JeDI currently holds more than 476,000 records on global jellyfish populations spanning the past two centuries. It has been designed as an open-access database for researchers, and the public, to use and contribute to. The results of the study, led by Dr Cathy Lucas from Southampton University, appear in the latest issue of Global Ecology and Biogeography . Imagine fleets of small boats cruising around the ocean, monitoring levels of plastic, oil and radioactivity, and eventually helping to clean up the ocean, and all completely unmanned. That may not be as far from reality as one might think. It is kind of like a seafaring drone. Oil spilled moves downwind : we are sailing upwind to capture it. 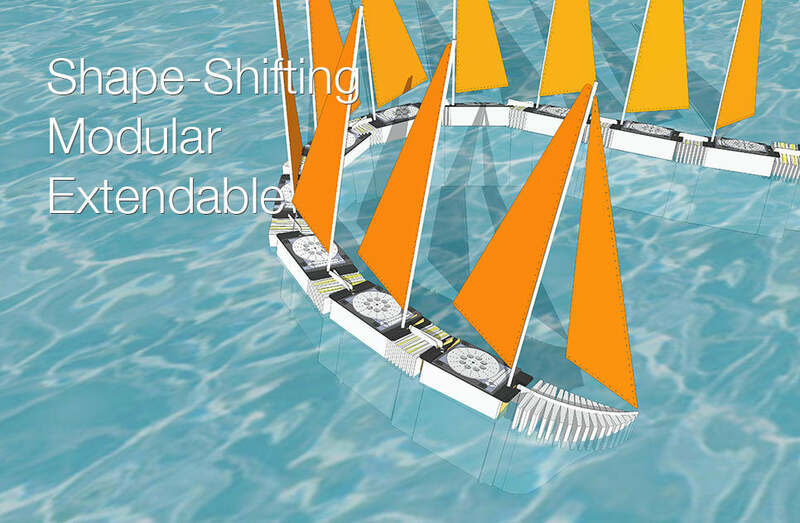 Protei is an ocean cleaning and research open hardware drone. For USD$700.00 you can build it yourself from a kit, or you can purchase a limited edition, fully assembled boat robot for $1,280.00. The one meter boat is built on a modular platform and can carry multiple modules behind it—so, theoretically, multiple censors or tools at once. Cesar Harada, the coordinator of Scoutbots, was inspired by the Deepwater Horizon oil spill in 2010 to move to New Orleans and begin working on better technologies to clean up oil spills (the current ones are inefficient and probably harmful in their own way). When TED Senior Fellow Cesar Harada heard about the devastating effects of the BP Oil spill in the Gulf of Mexico in 2010, he quit his dream job and moved to New Orleans to develop a more efficient way to soak up the oil. He designed a highly maneuverable, flexible boat capable of cleaning large tracts quickly. But rather than turn a profit, he has opted to open-source the design. Gabriella Levine, who has been a part of the Scoutbots community since she traveled to Rotterdam in the summer of 2011 to work on earlier iterations of Protei, tells techPresident that cleaning up oil spills is still a little ways off. Currently they are focused on monitoring the ocean, measuring levels of things like oil, plastics and radioactivity. There is an advantage to “being able to collect massive data sets by the power of swarms of robots rather than just from one big boat,” Levine explains. Scoutbots has already begun collaborating with two nonprofits: the Algalita Marine Research Institute, which focuses on the the impact of plastic pollution, and Safecast, which crowdsources radiation readings and mappings. Scaling up will be a challenge, says Levine, because the Scoutbots community is basically trying to do it alone. A long term goal is to get corporations interested in Scoutbots. Levine says they envision a model in which they don't necessarily sell the boats. Companies could adopt them and have a say on what they do without having to own or operate the boats. Levine says she is most excited to see the boats “proliferate around the world,” and also looks forward to seeing what comes of the crowdsourced development. In many ways Scoutbots reminds me of the open source drones designed for disaster relief, which I wrote about last June. Much of that work was shared on the website DIY Drones, which Levine says they seek to emulate. 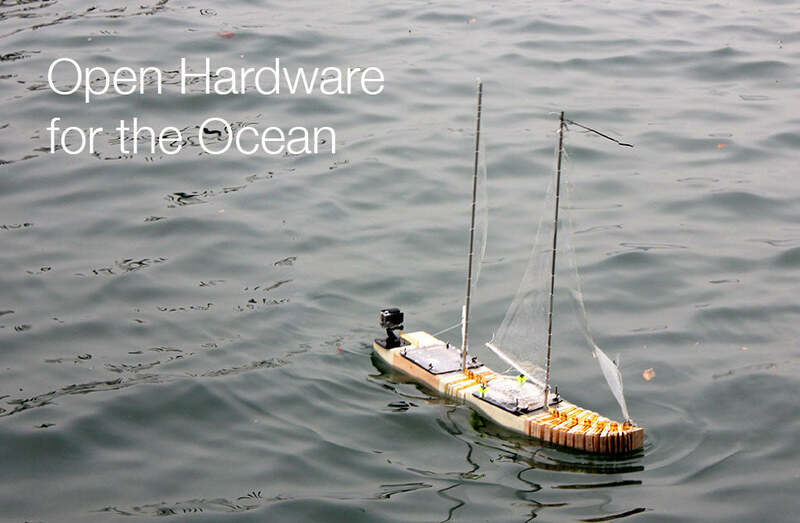 “We want to be the DIY Drones of the ocean,” she says.